Robinsons Greenhouses have long been recognised as the very best aluminium greenhouses by amateur and professional gardeners. Utilising high quality materials in innovative designs that provide maximum comfortable growing space, Robinsons combine strength and durability to produce super strong metal and aluminium greenhouses that are more likely to stand the test of time and Britain's ever changing weather! Robinsons metal frame greenhouses are guaranteed for 10 years and are often left standing when inferior greenhouses are destroyed in storms. 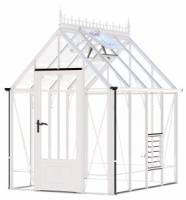 Whilst no greenhouse can be guaranteed to be 100% storm proof, the thicker aluminium bars, and the unique screw-in capping system that retains the glass in place combine to produce one of the strongest greenhouses available in the UK today. Brand new for 2017 3 new colours to choose from Old Cottage Green, Pastel Sage and Anthracite to run along side the regular Ivory, Classic Green and White.